"Murder, She Snored" was the fourth episode of the fourth season of the Daria TV series (episode number 404). It first aired on MTV on March 17, 2000. This episode was written by Peggy Nicoll. In History class, Anthony DeMartino returns some tests, remarking they were above his low expectations - not that most of the class seem happy with their marks, outside of Daria (100) and Brittany (66, "I passed and I got the extra point!"). However, the football team, and especially Kevin, have achieved surprising good scores. Not fooled, DeMartino confronts the QB and, after the latter is unable to answer simple questions, accuses them of cheating and threatens to fail the whole class if nobody comes forward to confess. In between classes, Mack and Brittany try to convince Kevin to admit having copied, but the latter refuses. Jane and Daria watch and comment on the situation, and Daria makes a joke regarding killing Kevin. 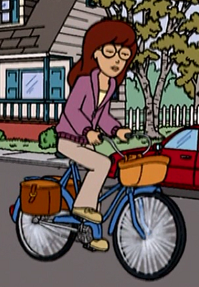 In Lawndale, Daria Morgendorffer rides her bicycle to school. Once there, she and Jane comment the cheating on the History test before finding Kevin’s dead body hidden in Daria’s double-size locker. Students and teachers gather around and wonder on the murder before Angela Li interrupts and accuses Daria. She interrogates her in her office with the help of DeMartino, O'Neill and a lying detector. The teachers play bad cop/good cop, pressuring Daria, but the student is unfazed and only provides sarcastic answers, poking fun at the teacher’s unrewarding careers and lack of prospects before walking out. That afternoon Daria relays the news to her parents, but again both Helen and Jake pay her little attention. At Casa Lane, Daria confides her fears to Jane before the latter shows her Trent’s apparent dead body. Jake, now a private detective, arrives that moment, just as Trent wakes up. Desperate for help, Daria hires The Fashion Club - aka Charlie’s Angels. The angels immediately go check the crime scene, though they get nowhere and the three J's quickly ruin the murder scene. The whole school attends Kevin’s funeral: the 3 J’s make a last check on the deceased; O’Neill breaks down crying on the podium; Daria and Jane question Brittany but get no useful answers; Mack is stumped when he tries to give an honest eulogy. Pressured later by Daria, he eventually reveals some anger at Kevin. Barch makes a gleeful speech about the QB’s death just before Jodie concludes the ceremony. Sometime later Daria rides through New York back to LWH. She examines her locker and finds a pink revolver just as Ms. Li appears with police officers Jake and Helen. Daria begs for a few minutes to solve the murder and has Jane assemble the suspects. When the relevant students and teachers are gathered, Daria tricks the culprits into revealing themselves by pretending the killer would have his/her hands dirty. Found out, the various (!) murderers confess: Jane, irritated that Kevin’s cheating would cost her a good grade, had poisoned his lunch sandwich; then Mack and Brittany, angry at the QB, had hit him with a golf club and shoot him with an arrow; Barch had kicked the unconscious young man; and DeMartino had mistaken the mortally wounded Kevin lying on the corridor as resting, strangled him and hid the body in Daria’s locker. … and Daria wakes up on her bed. Brittany asks Kevin "what's that A doing on your paper? ", but everyone has just the exact marks scored and not the lettered grades. This episode contains multiple lighthearted parodies of detective shows and movies. Since Daria's dreaming all the references and parodies, she's presumably a fan of one or more of the shows referenced. A) Allowed the French conserve their precious vineyards. B) Robbed Americans of their tax dollars. C) Didn't do a damn thing for this country. D) All of the above. Who belong the slogan "The New Frontier"? A) JFK. B) Captain Kirk. C) Davy Crockett. D) What happened to the old [frontier]? A) A national hero. B) A national disgrace. C) A ventriloquist's dummy. D) Just misunderstood. A) A weight loss plan. B) A humiliating episode in U.S. history. C) The Babe prequel. D) God I hate my life. The Daria Database, written two years earlier by Peggy Nicoll - the same writer as "Murder" and, from season 4, the story editor - mentions DeMartino was placed in Brookside Rest Home psychiatric hospital after assaulting Kevin. The end of this episode has Kevin being choked, the first of a few tie-ins to Database in this season (Kevin's parents in "Mart of Darkness" first appeared there). DeMartino's lesson at the start was about "Corruption and Scandal in American History", with the chalkboard mentioning "Tweed", "Iran-Contra", and the "Teapot Dome" (which he quizzes Kevin on). Mack looks resigned to the test and then his cheering teammates, implying visually that he knew about the cheating but didn't participate - and may be regretting it. In what's implied as a common scene, Jake is furiously ranting about his dislike of clients and his job, and Helen is on the phone ignoring him - Jake hasn't noticed. Wouter's "What if?" series depicts Jane's confession scene with a difference, instead of posioning Kevin, Jane used Laxatives instead. This page was last edited on 14 May 2018, at 20:29.